Individuals, organizations, and chaplains working with those in prison are welcome to print out our 29-page Resource Directory for Prisoners. This directory offers prisoners an open horizon of possibility and potential for personal support and psychological and spiritual well-being. 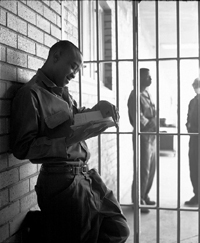 The Resource Directory for Prisoners provides inmates with access to Bible correspondence courses, Bibles and supportive Christian literature; Buddhist teachings and correspondence courses; Hindu teachings and courses; yoga teachings and materials; meditation instructions; Native American teachings and ceremonial items; ageless wisdom and esoteric teachings; pen pal correspondence; legal services and information; family and reentry support; counseling and drug rehabilitation services; free book services; continuing education; jobs and careers; creative writing and artistic resources; newsletters and magazines; personal health and nutrition resources. Most of the organizations listed in this Resource Directory offer their services, books, and literature free of charge to prisoners. Prison outreach organizations or individuals working with prisoners, you may download, use and distribute any of the resource materials we offer. You may customize the top, front page of the Resource Directory, using the name and contact information of your own organization or service. We will be happy to facilitate this by sending you the original Microsoft Word file so you can customize the document for your organization, or we can do this for you. Click on either of the links below to download or print our Resource Directory for Prisoners. If you would like to use the Resource Directory to contact organizations by email or by viewing their websites, we provide a version with active links.